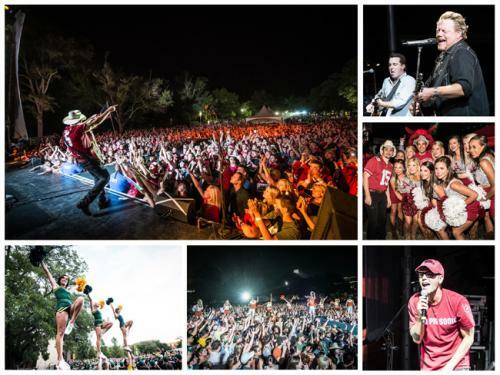 Brad Paisley’s Country Nation College Tour presented by Zaxby’s Plays to Over 65,000 Fans – So Far! This past weekend Brad Paisley continued his celebration of the 2015 college football season by taking his Country Nation College Tour presented by Zaxby’s to IMG College partner universities and providing free entertainment for the campus community. He played to capacity crowds at the University of Texas, Baylor University and the University of Arkansas for a total of over 65,000 for the tour – so far. Three time Grammy nominee and Texas native Pat Green was the special guest at the University of Texas and the comedy band The Raging Idiots (which features special guest Bobby Bones and Eddie from iHeartMedia’s national country radio program The Bobby Bones Show) was special guest at Baylor University and University of Arkansas. More tour dates for the Country Nation College Tour presented by Zaxby’s will be announced soon. All photos by Ben Enos.